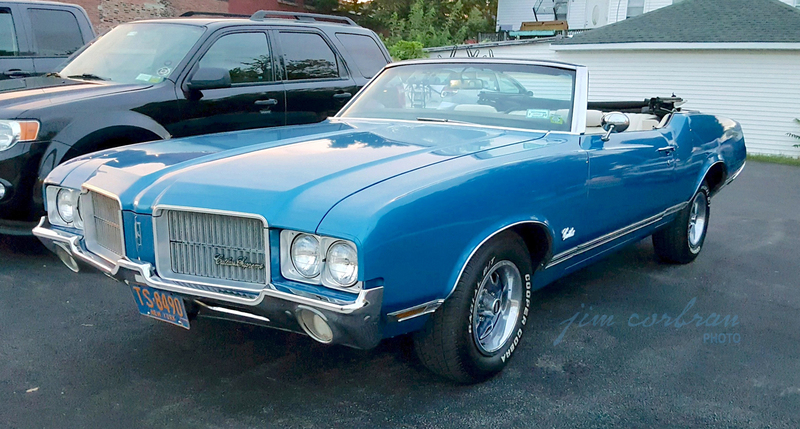 When this 1971 Oldsmobile Cutlass Supreme was new, Olds’ mid-sized nameplate was on its way to becoming one of the country’s best-sellers. The Cutlass was available in a wide range of body styles: two- and four-door sedans (officially sports coupes and town sedans), two- and four-door hardtops (hardtop coupes and hardtop sedans), this convertible, and station wagons in both the base Cutlass and the ritzier Vista Cruiser lines. Hanging on to a blast from the past, there was still one model left (a town sedan) which wore the F-85 badge; out of the 4,419 F-85s produced for 1971, only 769 came with an inline-six. Saw this blue convertible a few weeks ago in Buffalo’s Old First Ward.